Here’s another delicious outdoor recipe (I’m trying to get as many in as I can before our short New England summer comes to an end). Churrasco is basically grilled meat, which is popular in many South American countries, as well as some European countries. The pork tenderloin strips for this dish marinate in an herbed, smoked paprika mixture for a couple of hours, so plan ahead for this one! 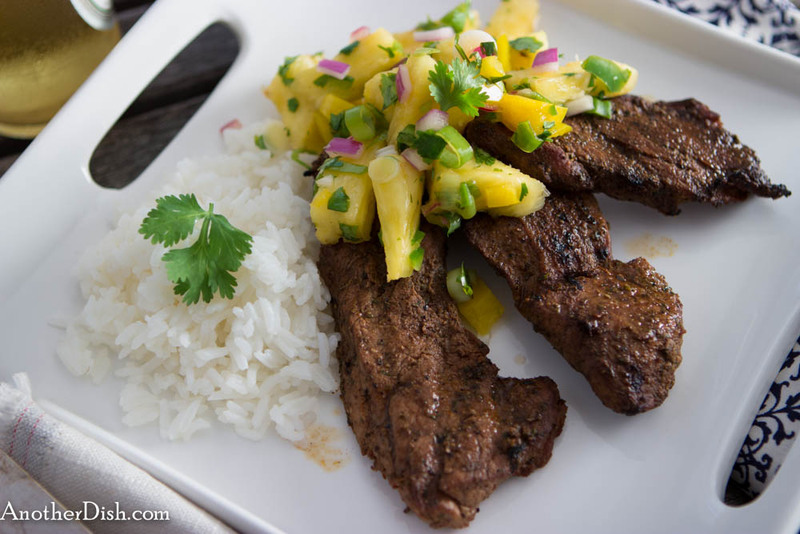 I’ve got to say that it’s well worth the wait — the flavors of the grilled, marinated pork combine very well with the fresh pineapple salsa. 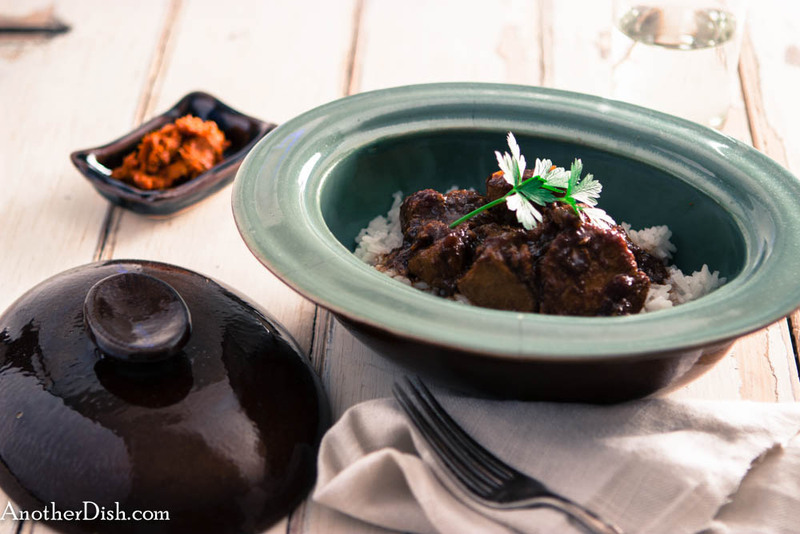 I hope you’ll try this dish! Heat oil in a small heavy sauce pan over medium-low heat. Whisk in the paprika and cook 5 minutes (very gently, so as not to burn the paprika) to infuse the oil. Remove from heat and let cool to room temperature (I put it in a bowl and then into the fridge to speed up the cooling process). Pour oil mixture into a blender. Add garlic, thyme, rosemary, salt and pepper. Blend marinade until herbs are finely chopped. Cut each pork tenderloin lengthwise into 4 strips. Pound each strip in between plastic wrap to a 1/3-inch thickness. 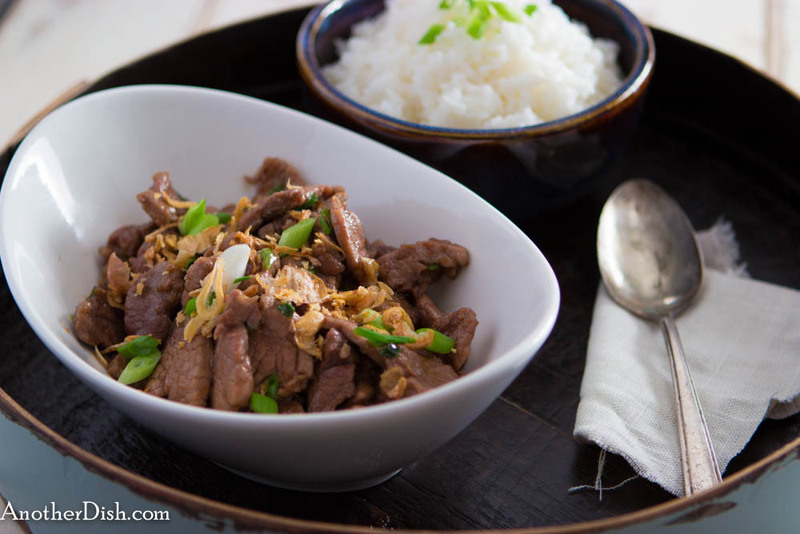 Place pork strips in a zip lock freezer bag; pour marinade into the bag and seal. Toss the mixture well, ensuring that pork is completely coated. Place in the refrigerator to marinate for at least 2 hours (turning occasionally). Meanwhile, prepare the salsa by combining the pineapple chunks, yellow bell pepper, green onions, cilantro, jalapeño peppers and several shakes of the tabasco sauce (to taste) in a medium bowl. Season with a bit of salt and pepper. Place salsa in the refrigerator for a couple of hours while the pork marinates. Prepare the grill. Remove pork strips from the marinade and grill about 2 minutes on each side. 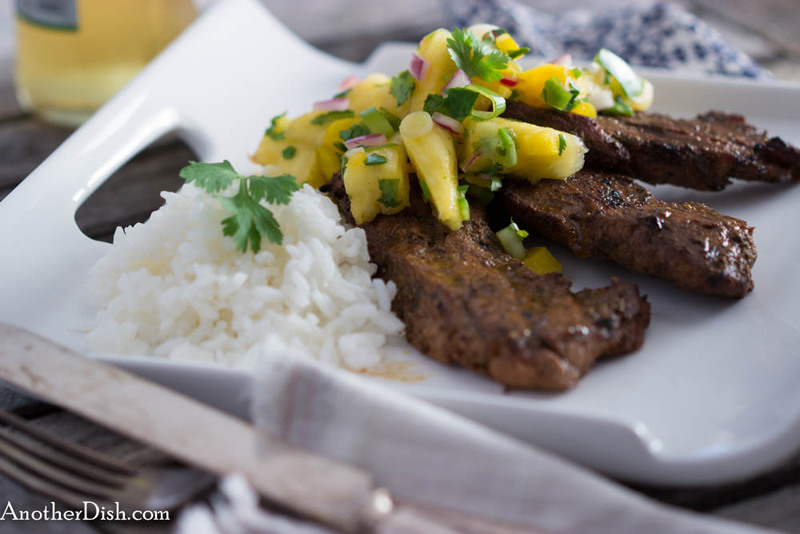 Serve the pork with the pineapple salsa and steamed white rice. This entry was posted in Brazilian, Main Dishes, Pork, Vegetables and tagged Brazilian Food, Chilies, Churrasco, Cooking, Food, Food Photography, Foodie, Pineapple, Recipes, Spicy on August 3, 2013 by AnotherDish.